Larry Rea – top row center. I went to school at Fern Hill . 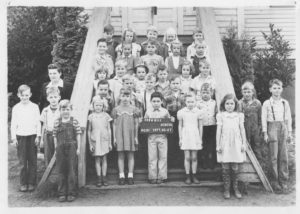 . . started the second grade in 1946 . . . when my folks moved from Portland after WW2 . . . back to the ranch where I was born. Fern Hill was a two-room country school with two teachers and four grades in each room. Mrs. Wengert taught the little kids and Mrs. Lowe had the big kids. The privy was outside . . . one for the boys and the other for the girls. During good weather we played “work-up” softball on the gentle slope of a grassy field. If the weather didn’t cooperate we used a large shed . . . played dodge ball on a sawdust floor. Everybody walked to school, so there was a two-room school about every three to four miles. A school bus provided transportation for the high school kids who went to the town of Rainier, but the little kids walked. I told my kids about having to walk a mile to school . . . in the rain and snow . . . past the neighbor’s vicious dogs . . . but I got no sympathy . . . even when I claimed it was uphill both ways. It was the issue of walking to school that created the Fern Hill School. 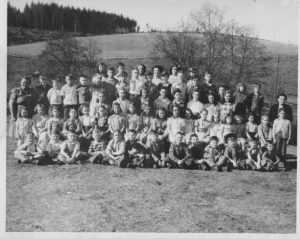 Cyril Witham said he attended the first year of the new school at Fern Hill in 1916 . . . his dad was instrumental in having the school built so his kids didn’t have so far to walk. The neighbors on the south side of the road were in the Apiary school district and the Witham kids were in the Stehman district so they got together and formed a new district. It was named Fern Hill School after the Witham’s Fern Hill Farm. Student body (Larry bottom row with the cowboy hat on. Teachers were Gladys Wenger and Nellie Caldwell. 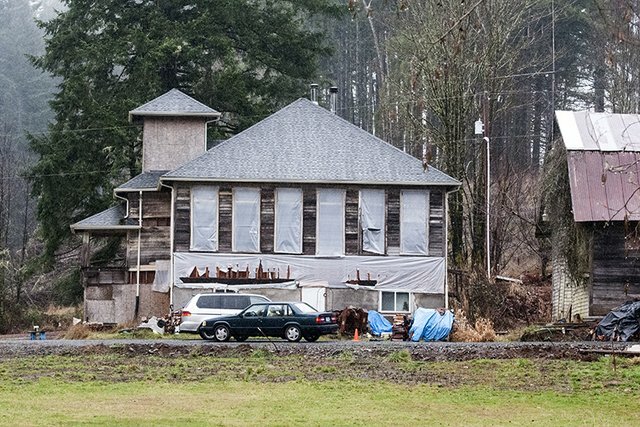 The school building was damaged in the April 13, 1949 earthquake that centered about 75 miles away in Olympia, Washington. It was rated at 6.7 on the Richter scale with a Mercalli intensity of severe. None of us had been in an earthquake before, so when the windows started rattling and the floor boards started jumping we sat in stunned silence . . . finally the teacher called out, “Earthquake! Everybody outside!” Then chimney bricks tumbled, cascaded down the roof and crashed onto the fire escape. Lucky for us, everyone went out the front door of the school and no one was hurt. The building was condemned. We finished the year using the nearby Fern Hill Grange hall. The school in town also was damaged so those kids had to go to school all over town . . . some in the skating rink . . . some in churches . . . wherever there was room. By fall, my fifth grade class went to the high school and used the cafeteria for a classroom. That meant that we country kids got to ride the school bus. Carl “Pat” Zimmerman bought the Fern Hill School property from the school district and converted the building into a country store and residence. Recently the property sold to the Witham family and they are restoring it to the original structure. Long live the Fern Hill School. Building the Bridge of the Gods (1928) . . .
Good article. I have heard a little different story from Sharon Tracy. Somewhere in between lies the truth! Nice job, Larry! I loved Fern Hill School. Apparently the damage from the earthquake was not as bad there as in town. I started 1st grade at Fern Hill in September of 1949. The next year it was closed and we rode the bus into town to the new Rainier Elementary School. Moving the Fern Hill students to town may have been political. Consolidation of the school was controversial… opposed by the town folks and desired by Fern Hill voters. Condemning the school building may have been the solution.